Options are called from DE/AGM cadre executives for the post of TDM Orai on look after arrangement basis. Renewal of SDE to DE look after for 20 executives. BSNL Board has decided to keep Compassionate Ground Appointment in abeyance for three years due to stressed financial condition of the company. This decision will be reviewed after 3 years. It is reliably learnt that the PMO today hold the meeting on revival of BSNL/MTNL. The Meeting was chaired by the Principal Secretary to the Hon’ble Prime Minster. Secretary (T) along with some Senior Officers of DoT and CMD BSNL/MTNL attended the meeting. According to calculations based on All India Consumer Price Index for Industrial workers for December 2018 (301), January 2019 (307) and February 2019 (307), IDA will increase w.e.f. 1.4.2019 by 2.6% from 138.8% to 141.4%. (d) Consideration of request/tenure transfers of DEs/AOs: We requested for consideration of request/tenure transfers of DEs/AOs. PGM (Pers) assured to look in to the matter. (e) Regularization of the date of Promotion of AGMs/DEs as 29.6.2018: We requested the PGM (Pers) to regularize of the date of Promotion of AGMs/DEs as 29.6.2018 irrespective of their date of joining duty and extension of subsequent benefits if any with respect to the date of Promotion on 29.6.2018 pursuant to the instructions contained in AGM (Pers.I) BSNL CO, New Delhi Letter dated 4.7.2018, 5.7.2018 & 6.7.2018. PGM (Pers) informed that due to pending Contempt case in respect of SDE to DE Promotion in the Hon’ble CAT Chandigarh the clarification/regularization orders could not be issued by the Personal Branch at present. However, after the settlement of the Contempt case necessary orders will be issued in this regard. DPE has circulated Schedule-wise list of Central Public Sector Enterprises as on March 2019. BSNL continues to be placed in Schedule-A. 20/02/2019:- Decisions of the AUAB meeting held on 20-02-2019. A meeting of the AUAB was held today to review the 3 day strike and also to chalk out the future course of action. General Secretaries / Senior officer bearers of all the constituents of the AUAB participated. The meeting whole heartedly thanked the entire Executives and Non-Executives who made the 3 day strike a historic success. The meeting also congratulated the circle and district level AUAB, for effectively organising the strike. With the view to carry forward the movement further to settle the charter of demands, the following programme of action is finalised. 1) Conducting March to PMO on 06.03.2019, by mobilising the employees from the surrounding circles. 2) Memorandum to be submitted to all the MPs, latest by 28.02.2019. 3) To send messages to the Hon’ble Prime Minister and Hon’ble Minister of State for Communications on Twitter. 4) Meeting the Hon’ble Minister of State for Communications wherever possible by our comrades. Today the CMD BSNL and Director(HR), BSNL Board met the AUAB leaders. The AUAB representatives told the Management that, they are prepared to accept 3rd Pay Revision with 5 % fitment, as offered earlier by the DoT. However, they demanded that this commitment should be given in writing by the DoT, so that the AUAB can consider deferment of the strike. Even this demand of the AUAB is not accepted. Further, the DoT has also diluted it's earlier assurance to give DA neutralisation. The DoT is demanding that the AUAB should call off the strike, in view of the terror attack in Pulwama. The Secretary, Telecom, has put a condition that she would not meet the AUAB leaders, unless they call off the strike. 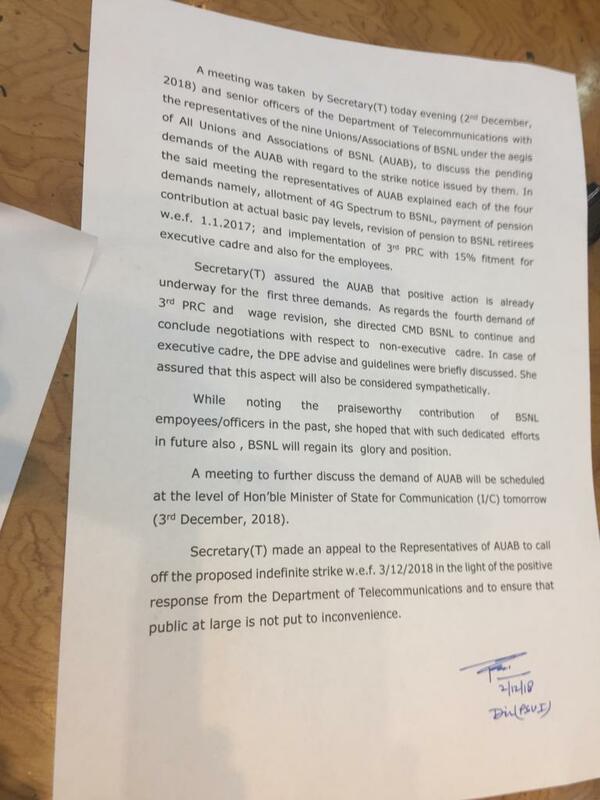 Immediately after the meeting with the BSNL Management, all the General Secretaries of the AUAB met and decided to go ahead with the strike. The AUAB has also decided to exempt J&K circle from the strike, to ensure maintenance of services, in the backdrop of the terror attack. The AUAB requests all the circle and district unions to organise the strike powerfully. AUAB leaders were invited by CMD BSNL on 13.02.2018 at 17.00 Hrs. in the presence of Dir(HR) & GM(SR) to discuss and apprise the developments on AUAB demands in DoT. CMD BSNL informed that today morning AUAB demands were discussed with Secy(T), DoT in details wherein on the issue of Pay revision Secy(T) mentioned that Hon'ble MOSC is ready to discuss with AUAB leaders under a condition that AUAB leaders should agree DOT proposal to decide 0% fitment by DoT itself and 5% fitment proposal will be sent to Digital Commission meeting being held on 21.02.2019 for clearance thereafter it will be taken up in the Union Cabinet for approval. AUAB leaders mentioned that DoT should not put any condition before discussion and other issues related to revival of BSNL should be discussed as assured by the Hon'ble in the earlier meetings held on 24.02.2018 and 03.12.2018. After this meeting AUAB leaders discussed the DoT proposal in its meeting held on 14.02.2018 at 15.00 Hrs. and decided that AUAB will firm to its demand of 10% fitment benefit till the time DoT don't give any concrete proposal in writing to AUAB and this decision was communicated to CMD BSNL by the AUAB leaders on 14.02.2019 at 17.30 Hrs. CMD further appealed to AUAB leaders to review their decision as suggested by DoT so that a meeting can be conducted between Hon'ble MOSC/Secy(T) with the AUAB leaders. In view of this AUAB leaders will further hold its meeting tomorrow on 15.02.2019 at 15.00 Hrs. to discuss and decide on the issue. In the above mentioned developments our CHQ office bearers andCircle Secretaries are requested to give their views/suggestions by today afternoon upto14.00 Hrs to further discuss in the AUAB meeting . As of now since there is no settlement of AUAB demands, we request all the Circle / District Secretaries to prepare for the successful implementation of 3 days strike with effect from 18.02.2019 to 20.02.2019. Update on GTI( Group Term Insurance) for BSNL executives : Meeting of Group Term Insurance Committee held today under the Chairmanship of Sr. GM (Estt), BSNL Corporate Office, New Delhi. Committee members GM (Trg) & GM(SR) were participated in the meeting. From AIBSNLEA side AGS (Fin) and AGS (DR) attended the meeting. Representatives of other associations SNEA, AIGETOA and SEWA were also present. In the meeting today, Committee finalized the GTI scheme and the policy documents and it is decided that MoU will be signed in next week. The policy will be effective from 01.03.2019. There will be two schemes with 50 lakhs coverage and 20 lakhs coverage. Those who are above 50 years they can also opt for either 50 lakhs or 20 lakhs scheme. ESS Popup will again be opened for 2 days for exercise/change the options. 6th AIC of AIBSNLEA at Vijawada. 1) To forward the Delegate List of their SSA by Mail to the Circle Secretary UP(E) as well as a copy to the CS of AP Circle Com. A. Koteswara Rao, DGM for the forthcoming 6th All India Conference of AIBSNLEA scheduled to be held at Vijayawada from 9.4.2019 to 11.4.2019. Mail ID: akrao1959@gmail.com, Mobile No. 094400 00505. 2) Also send Advertisements/Donations collected for the Souvenir as assured in the AIBSNLEA CWC Meeting held at Dehradun during August 2018. A well organized General Body Meeting/ Annual Conference of AIBSNLEA of Farukhabad branch was held on 22/01/2019 , which was attended by the executives of all streams posted at Farukhabad SSA. This meeting was addressed by Circle Secretary , Com G N Pandey ACS(Engg), Com Sri Jai Prakash Narayan President AIBSNLEA FKB , Com Sri S. C. Sahu Distt Secretary , Com D. K. Dixit President AIBSNLEA Kanpur and many other senior comrades. Detail discussions were held on various points such as 4 G services in BSNL , 3rd PRC , Group Term insurance policy , acute cash shortage in fields and other field related issues. Circle Secretary replies all queries raised by members. Later on election were held, in which Sri J. P. Narayan SDE, Sri S. C. Sahu SDE(NTR) and Sri Sanjay Kumar Sonkar SDE elected unanimously as President , District Secretary and Finance Secretary respectively. Association extends special thanks to Com Sri D. K. Dixit President AIBSNLEA Kanpur, Com Amar Singh Rathore Ex DS of AIBSNLEA FKB branch and Com J. P. Narayan for their important role in running/formation of branch at Farukhabad. At last vote of thanks was given by Com D. K. Dixit. After meeting CS met with GMTD FKB Sri Ramesh Prasad and discussed the HR issues of executives, field related problems etc. GMTD FKB acknowledged and assured to resolve the issues at the earliest. Guidelines for verification of personnal data of executives from service book. Guidelines regarding the retention of staff quarter beyond permissible period. Recruitment of MT(External) put on hold by Corporate Office. IDA raised by 3.2% w.e.f 01-01-2019 that is raised from the present 135.6% to 138.8%. Hon'ble CAT Chandigarh vacated the stay order from DE to DGM(T) promotion. Com. GS extended thanks to GM(Pers.) & Director(HR) for getting Stay Order vacated from DE to DGM(T) in the Hon'ble CAT Chandigarh. GM(Pers.) confirmed & expressed happiness on the vacation of stay order from DE to DGM(T) promotion. We requested GM(Pers.) to fill up all the vacant DGM(T) posts (about 900) on regular basis where the DEs working on adhoc basis & DE(Regular) have completed more than 4 years of regular service in STS cadre & now fulfilling the eligibility criteria of DGM(Regular) promotion. GM(Pers.) assured to expedite the CPC from DE to DGM(T) at the earliest. After continous persusuasion by our association , Time Bound Financial Upgradation for GM(CA) and Deoria SSA issued by circle office today. AIBSNLEA Protest against: BSNL Management has notified MT recruitment at STS level which will block the Career Progression of young talented executives of BSNL. AIBSNLEA has been demanding to promote executives to the Sr. level management by framing Internal Candidate Promotion Policy through fast track but BSNL Management ignoring this fact has arbitrarily further notified MT recruitment from out-sider quota and internal quota candidates. AIBSNLEA will protest against such move of BSNL management through organisational action and through legal proceeding. All the Circle / District secretaries are requested to keep ready for agitational programme. General Body Meeting & Election of Barabanki District Body on 06.12.2018.Comrade Sarosh Ahmad AO, Comrade S B Yadav DE and A K Singh AO elected as president, District Secretary, Finance Secretary respectively.From PHQ COM A K Verma CS,COM K K Ojha DS Lucknow and COM Prabhat Mishra ACS attended meeting and replied queries of the members.PHQ body is thankful for wonderful arrangement done by Barabanki comrades. DOT has issued record of discussions of the meeting held with the Hon’ble MOC I/C on 3rd December, 2018 with the AUAB leaders. The record of discussions has been sent vide BSNL letter No.-BSNL/7-1/SR/2018, dt-04-12-2018. Talks between the AUAB and the Secretary Telecom were held today the 02-12-018. Improvements are there in the issues of 4G spectrum, Pension Revision ad pension contribution. 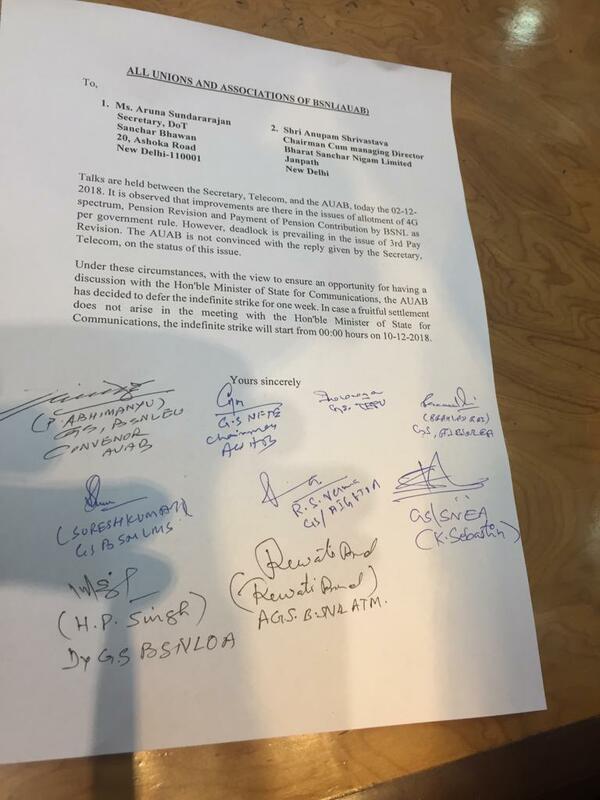 However, deadlock is prevailing in the issue of 3rd pay revision. With a view to ensure a discussion with the Hon. MoS(C) on this issue, the AUAB decided to defer the Strike for one week. If fruitful outcome does not come in the meeting with the Hon. MoS(C), the strike will start from 00.00 hrs on 10-12-2018. AUAB convention was held at Lucknow on 27/11/2018 at Kaiserbagh Telephone Exchange Campus , which was attended by CS AIBSNLEA & other PHQ office bearers and executives from Lucknow TD & Circle Office. This meeting was attended and addressed by Sri Shiv Kumar , President AIBSNLEA CHQ also. The central leaders explained all the five demands of AUAB and exhorted the anti BSNL and anti workers policy of Govt in Centre. They added that the strike is inevitable as no initiative is being taken by the Govt to satisfy the agitating workers. More than 500 workers including woman employees were present in the meeting and all shouted slogans to join indefinite strike w.e.f. 03-12-2018. For Photos of above meeting please click below given link. The CEC of AIBSNLEA UP(E) was held today 17/11/2018 at Karan Bhai Sabhagar , Gandhi Bhawan , Lucknow , which is participated by 15 branches of AIBSNLEA such as Lucknow , Kanpur,Hardoi, Sitapur, Farukhabad, Gorakhpur,Allahabad,Mirzapur, Circle Office, Mobile Unit,Civil/Electrical branch etc. In the CEC Sri A. K. Verma was elected as Circle Secretary and Sri Prabhat Kumar elected as ACS(HQ) unanimously. An emergency CEC meeting of AIBSNLEA UP(E) is scheduled on 17/11/2018 from 11:00 Hrs onwards at " Karan Bhai Sabhagar , Gandhi Bhawan , Lucknow". All DS/BS and Presidents of branches are requested to attend the above meeting. AIBSNLEA consistent efforts yielded result in getting released order regarding implementation of voluntary Group Term Insurance Scheme for BSNL Executives. In response of the call of AUAB , rally will be start from circle office at sharp 1:00 PM tomarrow. It will end at GPO Park. All comrades at Lucknow are requested to participate 100% in above rally for our genuine demands. AUAB has given a call of organizing Rallies at CHQ/Circle HQ/ SSA HQ levels on 14th Nov., 2018 demanding immediate resolution of following issues. (1) Implementation of 3rd PRC in BSNL with 15% fitment benefit (2) Payment of Pension contribution on actual basic pay (3) Pension revision of BSNL Pensioners (4) 4G spectrum allocation to BSNL etc. (5) Left out items of 2nd PRC. Today morning at 10.30 AM Secy(T), DoT hold a meeting with CMD BSNL, Director(HR) & GM(SR) wherein Secy(T) wanted to discuss the demands of AUAB with General Secretaries of AUAB but all the GSs were not available at Delhi thus the next meeting is fixed upon 2nd Nov., 2018 at 17.00Hrs in DoT with Secy(T), DoT. In today’s meeting Secy(T) mentioned that DoT is seriously implementing all the assurances given by Hon’ble MOSC (l/C) to AYUB Leaders in the meeting held on 24th Feb., 2018. Secy(T) DoT further informed that before 2nd Nov., 2018 Cabinet Note on 3rd PRC implementation in BSNL and 4G Spectrum allocation to BSNL will be ready for further necessary action. DoT recommendations on payment of pension contributions on actual basic pay of BSNL employees will be send to DOE for clearance shortly. Pension revision of BSNL pensioners is also under active consideration. Secy(T) DoT advised CMD BSNL & Director(HR), BSNL Board to inform this status to all the leaders of AUAB. Secy(T) will be on tour from 29th Oct.,, 2018 to 1st Nov., 2018 thus the meeting is fixed up on 2nd Nov., 2018. All DS of AIBSNLEA in UP(E) Circle are requested to provide the following details immediately. 1) Last date of Election of their body and copy of recognition letter issued by CS. 2) List of office bearears. The above information is required to submit circle office immediately to grant immunity from transfer to the DS/Finance Secretary/One ADS. It is also requested to recommend one of the ADS name ( If more than one) to grant immunity from transfer. Comrades it must be treated most urgent. Soft Tenure Posting Clarification Issued by BSNl C.O. A condolence meeting was organized today at 13:00 Hrs at Mahila Kalyan Kendra , Telecom Officers Colony , Kapoorthala , Aliganj , Lucknow in the memory of Late Sri A. K. Singh CS AIBSNLEA UP(E). The meeting was chaired by our GS Sri Prahalad Rai . The meeting was attended by executives of all cadres . The executives from nearby districts were also present at this occasion. The meeting was addressed by GS AIBSNLEA , Sri Prahalad Rai , Sri O. P. Dubey President AIBSNLEA UP(E) , Sri A. K. Verma ACS(Hqrs) , Sri Pradeep Kevlani CWC , Sri G. N. Pandey ACS(Eng) , Sri K K Ojha DS LWTD, Sri Naveen Kumar Srivastava BS Mobile Unit, Sri Anoop Kumar Pandey DS GKP TD, Sri Manoj Kumar Kushwaha DS KNP TD, Sri D. K. Dixit , President KNP AIBSNLEA , Sri I. M. Rao , DS Lakhimpur TD and many all other senior comrades . GS Sir given his condolences to the family of Late of Sri A. K. Singh . Later on 2 minutes silence observed in the meeting in the honour of Late Sri A. K. Singh. GS and all other Senior comrades met with the wife of Late A. K. Singh and assured her for any kind of help in future. Very Sad News:- Our beloved Circle Secretary Sri A. K. Singh has expired today. We convey our heartfelt condolences to the grieved family and pray almighty God to rest soul in peace. May God give strength to his family members to bear the loss. Instruction regarding one day salary contribution in PM relief Fund. CWC meeting of AIBSNLEA is scheduled at Dehradoon on 18th and 19th August 2018. CS alongwith CWC member will participate in the above meeting. All DS/BS are requested to submit their views on mail csupeast@gmail.com for discussion in CWC meeting. Special C/L for AIBSNLEA to attend the CWC meeting at Dehradoon from 18 to 19/08/2018. Allottment of seats for JTO Phase II training from 23/07 to 31/08/18 and from 30/07 to 07/09/2018 for departmental candidates. Review of extension of without voucher medical facility to retired persons. The list of JTO's for AIEL from UP(E). If there is any error , same may be intimated to circle office. AIBSNLEA actively participated in the lunch hour demonstration held at the office of CCA UP(E) on the call of All Unions and Associations of BSNL on the issue of 3rd PRC implementation in BSNL. During this occasion Comrade Sri A. K. Verma ACS(HQRS) , Sri G. N. Pandey , ACS(Eng) , Sri K. K. Ojha , DS LWTD , Sri A. K. Singh ADS LWTD , Sri Naveen Kr Srivastava BS Mobile unit , Sri R. K. Mishra SDE MS and many other senior comrades were present. At last a memorandum was submitted to CCA UP(E) . For detail please click below link. BSNL CO has clarified that the facility of immunity from transfer shall not be available to those who become office bearers after the issue of their transfer order. ALL UNIONS AND ASSOCIATIONS OF BSNL (AUAB) issues notification for organising demonstration and relay hunger strike, demanding immediate implementation of the assurances given by the Hon'ble MoS(C). In it's meetings held on 26.06.2018 and 04.07.2018, the AUAB has called on the BSNL employees to organise demonstration on 11.07.2018 and relay hunger strike on 24th to 26th July, 2018, demanding immediate implementation of the assurances given by the Hon'ble MoS(C) on 24.02.2018, with regards to 3rd Pay Revision, Implementation of Government of India Rules for payment of Pension Contribution by BSNL, Allotment of 4G spectrum to BSNL and Pension Revision. The AUAB issued notice today to the Secretary, DoT and CMD BSNL, for this agitation. All the PHQ Office Bearers, Circle / District Secretaries of AIBSNLEA are requested to implement the above agitational Programme in true spirit. Promotion orders for 773 SDE(T) to AGM/DE(T) issued by corporate office. Left out promotion order of SDE to DE grade: All the un-accessed cases received at corporate office from Circles and promotion orders areexpected shortly. Promotion orders issued by corporate office for 11 executives in EE(Civil) Grade. Posting orders issued by circle office. All are posted at same place. Congratulations !!! Due to consistant efforts of AIBSNLEA , corporate office issued promotion orders from SDE (E) to EE (E) . Congratulations , due to consistant efforts of AIBSNLEA , orders are issued by corporate office for promotion in DGM(Finance) grade. Comrades, attached list is a list of un-accessed cases due to non availability of screening committee report etc. All the DSs are requested to collect and send the representations of recently promoted SDE Telecom through SCF quota and LDCE quota for their change of posting as per their request to CHQ for consideration and pursuance. Corporate Office issues a letter to CGM's regarding posting of newly promoted SDE(T) on "As is where is " basis. AIBSNLEA is pursuing for the implementation of above letter in UP(E) Circle. Salary disbursement schedule for BSNL employees from July 2018. Vigilance Clearance required by corporate office for considering the promotion of executives in AGM/DE(T) grade. JTO to SDE(T) SCF quota , promotion and posting orders issued by circle office for 68 executives . BSNL Corporate Office issues orders regarding implementation of Kerla high Court order dated 05/06/2018 . Congratulations to all newly promoted JTO's in SDE(T) grade. AIBSNLEA' untiring and persistant efforts yielded results in getting released promotion orders of JTO(T) to SDE(T) grade in BSNL against 67% SCF quota. Total executives promoted from JTO(T) to SDE(T) is 3089. For order please click below given link. Date of joining and promotion for 11 executives in SDE cadre required by Circle Office. Clarification / guidelines issued by corporate office regarding data updation in ERP by different streams executives. Screening committee report required by corporate office for promotion to AGM/DE. BSNL CO advised to all executives to fill up immediately personnal data in ERP required for DPC through ERP portal. BSNL Corporate Office has called for data / tabulation sheet of all executives from seniority list no. 8 for DPC from SDE(T) to DE/AGM(T). For letter pl click below link. BSNL Corporate Office revised seniority of 147 LDCE passed executives of TES Group B as per Supreme Court judgement dated 12/12/2017 in CA no. 392 of 2017. For detail information please click below given link. BSNL C.O. , New Delhi circulated list of executives for data updation in ERP. All are requested to go through the list corresponding to their data and get it corrected in ERP. Last date given by C.O. is 06/06/18. For list please click below link. Promotion from JTO to SDE(T) LDCE 2015 , list of 103 left out cases issued by BSNL C.O. , New Delhi. CPSU cadre Hierarchy approved by BSNL Board on 28/05/2018. BSNL Board in its meeting held today afternoon at Hyderabad approved CPSU Cadre Hierarchy on prospective dated i.e. date of notification will be the date of implementation. The CPSU Cadre Hierarchy implementation with prospective date will not benefit the existing executives. In view of that before its notification, AIBSNLEA will continue its efforts to get fill up all Group-B and STS/JAG equivalent vacant posts of all disciplines through CPCs. The suggestions given by AIBSNLEA to consider time bound functional promotion upto AGM Level, Jt. DGM designation to the STS level officers working in E-5 grade has been considered and approved by BSNL Board. The other issues i.e. eligibility conditions for promotion from SDE/AO to DE/CAO within 7 years instead of 12 years, benchmarks on numerical basis and SC/ST roster implementation have been considered or not will be find out shortly. It is learnt that BSNL Board has recommended to abolish all SDE/AO, DE/CAO equivalent posts w.e.f. 01st July, 2018. Thus the all vacant posts of Group-B and STS level are necessarily required to be filled up by conducting CPCs before 1st July 2018 so that the existing majority executives may get desired benefits of CPSU Cadre Hierarchy. BSNL Management has to take immediate necessary steps to finalize that TES Group-B seniority as per the Honorable SC judgments to fill up the vacant posts to avoid further litigations. Posting of LDCE 2015 JTO in SDE cadre in UP(E) Circle. Promotion and posting of JTO's to the grade of SDE(T) in BSNL under CQ (33%) on the basis of LDCE 2015. BSNL CO New Delhi letter and 5 Lists having 1987 executives name given below. JTO(C) to SDE(C) promotion order on regular basis in SCF quota by Corporate Office . BSNL Corporate Office has decided to call for details of officer bearers of recognized/support/SEWA associations at SSA/Circle level/CHQ. Further, circles are requested to incorporate the statistics of such office bearers against their names in the long stay list of the circle which is due to furnish for the financial year 2018- 19. Extension of look after arrangement for 85 executives from SDE to DE/AGM cadre for 180 days w.e.f 15/05/18. Look after arrangement for 06 executives from DE to DGM/TDM . Present CS , AIBSNLEA UP(E) Sri Pradeep Kevlani is proceeding on leave from 15/05 to 02/06/18 . During his absence Sri A. K. Verma ACS (Hqrs) will look after the cahrge of CS. 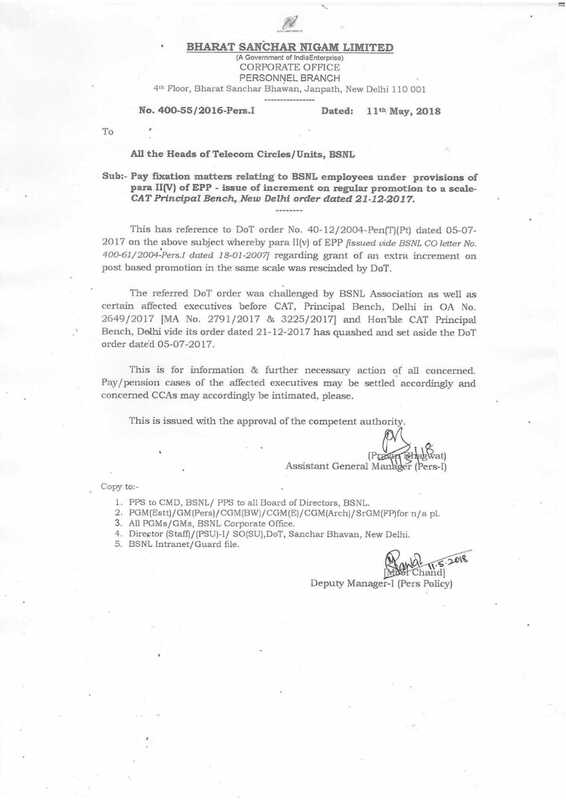 BSNL Corporate Office issues orders regarding Pay fixation matters relating to BSNL Employees under provisions of EPP - Issue of increment on regular promotion to a scale - CAT Principle Bench New Delhi orders dated 21.12.2017. For letter Pl.ease click below link. SDET RR 2002 modified by BSNL Corporate Office. Look After arrangement for 03 executives from DE to DGM/TDM. For order please click below links. SDE to DE look after for 16 executives issued by circle office today. CS writes a letter to CGMT UP(E) Circle regarding cancellation of transfer orders of Sri D. K. Singh ,SDE Barabanki . Today CS Sri Pradeep Kewlani along with Sri G N Pandey ACS(Eng) met with Sri J. M. Tripathi GM(HR/Admin) to discuss HR related issues of Executives. The detail discussions on HR issues of field staff , SDE to DE(LA) and DE to DGM(LA) as well as cases in which officers has refused look after promotions were also discussed. Guidelines issued by Circle Vigilance for work through Tender/Quotation. Grant of Immunity to the office bearers of Associations Clarifications:- BSNL CO has issued clarifications on grant of immunity to the office bearers of associations. 11/04/2018:- Day Long Dharna on 12/04/2018 at BSNL Corporate Office/Circle Office/SSA Hqrs will be organised by all associations and unions of BSNL. All are requested to participate 100%. Our Demand is ROLL BACK TOWER SUBSIDIARY FORMATION. Circle Secretary Sri A. K. Singh is at present on leave due to medical grounds. In the absence of Sri A K Singh , the charge of Circle Secretary will be look after by Sri Pradeep Kevlani CWC Member.The contact No of Sri Pradeep Kevlani is 9415322208. On the call of unions and associations of BSNL , AIBSNLEA participated actively in lunch hour demonstration held at circle office. After lunch hour demonstration a memorandum addressed to MOC Sri Manoj Sinha was submitted to CGM UP(E). The annual conference of Kanpur District was held on 23/03/2018 , which was attended by the executives of all streams. In this conference election for the new body was also held , in which Sri D. K. Dixit DE(CM) , Sri Manoj Kumar Kushwaha JTO(BNJ) and Sri P. K. Shukla AO(MRD) was elected unanimously as President , District Secretary and Treasurer respectively. Corporate Issues letter regarding opening of field offices on holidays of 29th & 30th March 2018. BSNL CO proposed new method of membership verification for granting recognition to unions/associations in BSNL. A general body meeting of AIBSNLEA Mobile unit was held today . In this meeting CS along with Sri Ranjan Kumar ACS(HQ) , Sri G N Pandey ACS(Eng) and Sri A K Verma OS were also present. The meeting was attended by execituives of all streams. In this meeting general discussions on various issues such as HR and field related problems of mobile unit etc were discussed. Later on Sri A K Sharma AO MS , Sri Naveen Kumar SDE MS and Sri Atul Kumar JTO elected unanimously as President , Secretary and Treasurer of AIBSNLEA Mobile Unit branch. For glimpses of above meeting please click below link. The annual General Conference of AIBSNLEA Lucknow Telecom District was held very successfully on 17/02/2018 in a grand manner at Karan Bhai Sabhagar , Gandhi Bhawan, Lucknow. The meeting was attended by all senior officers as well as by more than 100 executives of Lucknow TD. The conference was inaugurated by Sri R C Rai PGMTD Lucknow and Sri Devendra Singh GM(O) Lucknow Telecom District. During this occasion Sri A K Singh CS , Sri Pradeep Kewlani CWC member , Sri H N Singh ACS(F) , Sri G N Pandey ACS(Eng) and many other senior comrades were also present. The welcome address was given by Sri Ranjan Kumar DS LWTD. All the dignitaries on the dias were warmly welcomed by presenting bouquets and mementoes . CS in his speech thanks to existing body specially DS Sri Ranjan Kumar for their cooperation with circle body during their period. Later on election were held under the chairmanship of nominated election officer (Sri G N Pandey ) and Astt Election Officer(Sri Pradeep Kewlani) . Sri R. K. Tripathi CAO(TR) , Sri K. K. Ojha DEP(INR) and Sri D. K. Choudhary SDE(OCB KSB) elected unanimously as President , Distt Secretary and Finance Secretary respectively. In his impressive speech newly elected District Secretary Sri K K Ojha Ji thanks and assured to all members as well as to CS for their full devotion / cooperation for the betterment of association and his members. At last vote of thanks was delivered by Sri H N Singh . Introductory meeting of newly elected office bearers of AIBSNLEA UP East Circle with CGMT UP(E) Circle is scheduled on 19/02/2018 at sharp 17:00 Hrs. All circle office bearers are requested to reach Circle office by 16:30 sharp. Screening Committee Report and APAR's / Shown Certificate of regular DE/AGM required by corporate office immediately for DPC. The 6th Circle Conference of AIBSNLEA UP (East) Circle was organized on 20.01.2018 at the Rai Umanath Bali Prekshagrh , Kaiserbagh , Lucknow in a grand manner. The Conference was attended by Com. S. Shivakumar President AIBSNLEA CHQ and Sh. Devesh Sharma, Organizing Secretary (North) from AIBSNLEA CHQ side. Hon’ble Minister (Industrial Development) Govt. of Uttar Pradesh Shri Satish Mahana was the Chief Guest in the Conference. Shri S.S.Dang, Ex Minister Govt. of Uttar Pradesh was the Guest of Honour in the open session. Shri Devendra Singh, PGMTD Lucknow, Shri J.K.Sah, PGM NTP Lucknow, Shri Maniram PGM (Central Area) Lucknow and Shri Jitendra Mani Tripathi GM (HR) UP (East) Circle attended the OPEN SESSION as Special Guests. The theme of the open session was “BSNL Services in Digital India”. All the dignitaries on the dias were warmly welcomed by presenting bouquets and shawls / mementoes. Circle Secretary AIBSNLEA UP East Shri A.K.Singh welcomed all the dignitaries. He mentioned the BSNL’s tremendous role in overcoming the natural calamities in Maharashtra Floods and calamities at Uttarakhand and J&K. He informed that the present teledensity has been achieved only due to BSNL. He also mentioned that the BSNL role is very important for making “Digital India” a reality in true sense by executing NOFN work for 1 Lakh Gram Panchayat connectivity, NFS project for defence sector, NGN implementation etc. He appraised the role of AIBSNLEA Circle body in resolving the issues of the Executives' of UP (East) Circle. He thanked the CHQ for its tireless efforts for resolving the UP (East) Circle Executives' problems. He mentioned the need to start E-Mitra services in UP (East) on the footsteps of Rajasthan. At last he welcomed all the distinguished guest for their esteemed presence in the Circle Conference. Shri Jitendra Mani Tripathi GM (HR) UP (East) Circle in his address thanked AIBSNLEA UP (East) Circle to invite him in the grand Open session with mammoth gathering of Executives'. He mentioned the role of BSNL in providing quick restoration services in natural calamities. He appealed all to work together for BSNL Viability. At last he congratulated AIBSNLEA for the grand success of the open session. Com. Devesh Sharma, OS (North) AIBSNLEA CHQ congratulated the comrades of AIBSNLEA UP (East) Circle for the successful holding of Circle Conference and thanked the comrades for their grand participation. He conveyed the wishes of Com. GS for the successful Circle Conference, who could not, attended the conference due to some family matter emergency. He congratulate the UP (East) comrades for making the AIBSNLEA as No. 1 Association in the UP (East) in referendum. Com. OS (North) extended a warm thanks to Hon’ble Ministers for sparing his valuable time for the Open Session. He mentioned that the Digital India can be formed by only the Digital Empowerment of its citizens. He mentioned that Digital India plan includes the advanced features for the Citizens like, storing of Digital Documents, Online registrations, e-medicines, Digital signature, Next Generation networks, converging of voice and data. For achieving the same, BSNL is playing a vital role in NOFN project. Com. OS mentioned that the BSNL is contributing a lot in Digital India Plan by its prestigious NOFN project in which 250000 Gram Panchayats will be connected by 100 Mbps connectivity. Com OS further mentioned that the 3rd PRC is very important for boost the moral of the BSNL Employees and requested to Hon’ble Ministers to use their good offices to convey this feeling to Hon’ble MOC&IT. He apprised about the future Struggle Programme of All Unions and Associations of BSNL for settle the demands i.e 3rd Pay Revision with 15% fitment from 01.01.2017, Settle pension revision, Settle left-out issues of the 2nd PRC, Roll back the creation of Subsidiary Tower Company and No reduction in the retirement age from 60 to 58 and no VRS. At last he congratulated AIBSNLEA UP (East) for the grand success of the open session. Guest of Honour in the Open Session Dr S. S. Dang, Ex Minister Govt. of Uttar Pradesh mentioned that BSNL is always a pioneer name for the speed of Communication. He mentioned the Hon’ble PM dream project i.e. Digital India and told that its implementation’s responsibility lies on BSNL only. He told that only in digital era, the common services can be extended to the poorest citizen. At last he congratulated AIBSNLEA for the grand success of the open session. Special Guest of the Open Session , PGM NTP Lucknow Shri J. K. Sah in his address explained the role of BSNL in Digital India Project. He informed that our debt is only 3200 crores. He mentioned that BSNL’s 1.9 Lakh work force is an asset for BSNL. He suggested the need of revenue generation by network sharing. At last he congratulated AIBSNLEA for the grand success of the open session. Special Guest of the Open Session , Shri Maniram PGM (Central Area) Lucknow thanked AIBSNLEA UP (East) Circle to invite him in the grand Open session with mammoth gathering of Executives'. He praise the theme of the open session “BSNL Services in Digital India” in present scenario and told that AIBSNLEA has always a great concern about BSNL’s viability. He expressed that today life has become much simpler due to digitalization and the most beneficiaries will be rural citizens. He stressed on the need to provide the Quality of Services especially in Landline segment. At last he congratulated AIBSNLEA for the grand success of the open session. Special Guest of the Open Session, PGMTD Lucknow Shri Devendra Singh in his address mentioned that the BSNL’s customer base is increasing even in this throught cut competition’s scenario. He suggested that BSNL should bring all our rural exchanges on NOFN ring. He mentioned that only work satisfaction may provide the highest level of quality and scope of improvement is always there. At last he extended his warm greetings for the grand success of the open session. All India President Com. S.Shivakumar in his address conveyed his greetings for the grand success of the open session. He explained that 4G spectrum is the need of the hour for BSNL for more revenue generation. He mentioned that AIBSNLEA is perusing in this regard for obtaining good quality of spectrum. He told that from last 3 years BSNL was in operating profit but this year it has been reduced. He mentioned in detail about the efforts made by the AIBSNLEA for BSNL’s viability i.e SWAS, Customer Delight Month/Year etc. He expressed that in the leadership of present CMD Shri Anupam Srivastava Ji, BSNL has regained its past glory. Com. President congratulate the UP (East) comrades for making the AIBSNLEA as No. 1 Association in the UP (East) in referendum. He explained the efforts of AIBSNLEA for the proper CPSU implementation according to Khan Committee recommendations, getting large number of DGM promotions, superannuation contribution enhancement from 3% to 5%, resolving the JTO 2005 batch pay anomaly, Standard pay scales, extension of 5 increments to 2007 batch JTOs, 147 competitive quota case. He mentioned the need for proper justified fast track promotions to existing in house talent rather than induct the MTs/DR DGMs. He mentioned that the court stay on the withdrawal of the additional increment was only brought by AIBSNLEA. Com. President mentioned that AIBSNLEA is only making sincere efforts for 3rd PRC by continuously perusing in DOT. Com. President appraised the house about the NIL achievement up to today by the so called recognized representative Association. He advised to think and work hard for the viability of BSNL. At last he congratulated AIBSNLEA UP (East) for the grand success of the open session. Com. Phool Chandra, President AIBSNLEA UP (East) extended the vote of thanks. The entire Conference Hall was Jam Packed with mammoth gathering. At the end of the Circle Conference the unanimous elections were held for the new Circle body for the next term. Com. O.P.Dubey CAO Lucknow TD, Com A.K.Singh DE Lucknow TD and Com Mukesh Gupta SDE Lucknow TD were unanimously elected as Circle President, Circle Secretary and Circle Treasurer for the next term. Com Pradeep Kewlani, SDE(E) were elected as CWC member. Options are called by circle office for look after arrangement from DE to DGM cadre . DOT appointed Shri Amit Yadav (IAS) ,Joint Secretary (Admin), DOT as CMD of tower subsidiary company of BSNL. DOT vide its letter no.79-51/2017 -SU dated 21.12.2017, has appointed Shri Amit Yadav (IAS) ,Joint Secretary (Admin), DOT as CMD of tower subsidiary company of BSNL. It is surprising that as per Union Cabinet decision the tower subsidiary will be fully owned by BSNL , but after seeing the DOT order it is difficult to understand that whether tower subsidiary will be controlled directly by DOT or through BSNL. We strongly oppose such active move of Government to fragment BSNL assets. Special C/L for 04 days in a year for blood donation. Order issued by DPE for special C/L for donation of blood to licensed blood banks on working days upto maximum of 04 spl . casual leave on submission of valid proof of donation. IDA increased w.e.f 01/01/18 from 124.3% to 126.9%. Order issued by DPE. Circle Secretary along with Sri Ranjan Kumar DSLWTD , Sri Pradeep Kewlani CWC , Sri G N Pandey OS and Sri Prabhat Mishra ACS met with CGM on 02/01/2018. During this meeting Sri Jitendra Mani GM(HR/A) was also present. First of all CS, greeted to Hon. CGM and GM(A) on behalf of AIBSNLEA , on the occasion of new year. CGM and GM(A) also gave new year good wishes to association and its members. After that discussions were held on various topics such as HR issues of executives , transfer requests/Rule-8 transfer request of executives , look after arrangement from JTO/JAO to SDE/AO , SDE/ AO to DE/CAO and DE/CAO to DGM(T)/DGM(F) . The look after arrangement in Civil /Electrical wings was also discussed. Hon’ CGM assured to look on all above matter positively. The meeting was lasted for two and half Hrs. Revision of Outdoor Medical Reimbursement w.e.f 01/04/2018 @ 78.2% fixation for upto 23 days. All District Secretaries/Branch Secretaries are requested to approach with new executives / non members immediately and enroll them as members and submit the form for contribution deduction from salary before 10th of Every Month. Change from one association to other association can be made from 15th December to 15th January , once in a six month. All SSA/Division/Branch Secretaries are requested to take special efforts in this regard and enhance the membership. Membership form and subscription form are enclosed. CS writes the letter to CGMT UP(E) regarding acceptance of refusal of DE(LA) by 02 executives. CS expressed sincere thanks to all the comrades circle/distt office bearears / all comrades for active participation and mobilisation to make two days strike with grand success. All PHQ Office Bearears / District Secretaries and Branch Secretaries are requested to ensure 100% success of the strike call on the appeal of All associations and Unions of BSNL. Circle Conference of AIBSNLEA UP(E) Circle is scheduled at Rai Umanath Bali Auditorium , Lucknow on 20/01/18 to 21/01/18. For notification pl click below . The Circle Conference of AIBSNLEA UP(E) Circle is proposed on 20/01/2018 at Lucknow. The details will be intimated soon. CS along with Sri Pradeep Kewlani CWC , Sri S K Singh ACS , Sri N K Verma BS , Sri A K Verma BS and Sri Rakesh Sonkar Fin Sec of Circle Branch met with GM(Admin/HR) to discuss various HR problems / issues faced by the executives specially members of AIBSNLEA . Detailed discussions were held on various HR issues faced by the executives in the fields. GM(Admin/HR) acknowledged the issues raised by our association and assured to look positively in the matters. The meeting was lasted for 02 Hrs. Submissions made by AIBSNLEA to PGM(Pers.) on CPSU CH Proposals on 15/11/2017. For details please click below. E4 to E5 financial up gradation of 08 executives of accounts. Hon'ble Governor of U.P. Sri Ram Naik ji forwarded representation/memorandom of AIBSNLEA UP(E) to Sri Manoj Sinha , Minister of Communication , Govt of India regarding implementation of 3rd PRC in BSNL. AIBSNLEA UP(E) Circle participated actively in the lunch hour demonstration at circle office , which was called jointly by BSNL Associations/ Unions demanding immediate implementation of 3rd PRC with 15% fittment at BSNL. During this occasion CS along with Sri Ranjan Kumar DS LWTD, Sri Pradeep Kewlani CWC , Sri N K Verma BS Circle Office , Sri R K Mishra BS Mobile , Sri G N Pandey OS(C) and many other sr. comrades of AIBSNLEA were present. A general body meeting of Lucknow SSA was held on 06/10/2017 at Kaiserbagh Xge Campus , which was attended and addressed by CS along with Sri Ranjan Kumar DS LWTD, Sri Prabhat Mishra ACS , Sri Pradeep Kewlani CWC, Sri K K Ojha ji and many other senior comrades. The GB was attended by executives of all streams such as accounts , engineering etc. In the meeting discussions were held mainly on the problems faced by executives in day to day maintenence work of indoor as well as outdoor services and HR issues of executives . All Unions and Associations of BSNL serves upon a notice for agitational programme to the Secretary (T), DoT and the CMD, BSNL on 3rd Pay Revision and Subsidiary Tower Company issues. AIBSNLEA is also a constituent Association of this forum. d) Indefinite strike will be organised thereafter, if the issues are not amicably settled. The date of the indefinite strike will be announced in due course. All BSNL Unions and Associations in the meeting held on 04/10/2017 at New Delhi has unanimously decided to organize protest action or the implementation of 3rd PRC with 15% fitment benefit. Settlement of left out issues related to 2nd PRC and against creation of BSNL's Tower Subsidiary. 1. Lunch Hour demonstration on 16-10.2017 at BSNL CO New Delhi, all Circle/ SSA level. 2. "Human Chain"on 16-11-2017 at BSNL CO New Delhi, Circle/ SSA level. 3. Two days strike on 12th and 13th December 2017 and even then the issues are not resolved the indefinite strike will be organized till the time demands are settled. The notice to the Management will be served on 10-10-2017 after the signature of all the General Secretaries of BSNL Unions/Associations. Comrade GS and President attended the meeting. Revision of IDA w.e.f.01/10/2017:- DPE has issued order to revise IDA from 119% to 124.3% w.e.f. 01/10/2017. The massive lunch/closing hour demonstration organized by AIBSNLEA and supported by BSNL Unions/Associations on 04/10/2017 implemented very successfully at Circle Office/SSA Hqrs. Executives and non executives from all streams participated very actively and enthusiastically. The huge gathering at circle office was addressed by CS AIBSNLEA and by Sri Pallob Bose CS and Sri Pradeep Goyal AGS of All India Retired BSNL welfare Association , Sri Jamel Ahmad CS AITEEA , Sri Sanjay Dubey NFTE and Sri Sudama Mishra of BSNLEU. At this occasion Sri Pradeep Kewalni CWC member, Sri R K Mishra DS Mobile wing , Sri Ranjan Kumar DS LWTD , Sri G N Pandey OS(C),Sri N K Verma DS Circle Office and many other senior comrades from accounts/civil/electrical wings were present. At last memorandum was submitted Hon'ble MP Sri Rajnath Singh through their PS and to Hon'ble Governor of UP Sri Ram Naik through their ADC and PGM (HR /Admin) Circle office as CGM was out of station. For glimpses of lunch hour demonstration of 04/10/2017 , pl click on below link. All District Secretaries/Branch Secretaries/PHQ Office Bearears are requested to ensure successful participation of all executives in tomarrow's lunch hour demonstration at Circle/SSA Hqrs. BSNL Corporate Office issues instructions regarding Implementation of Superannuation Pension Scheme as per BSNL Employees Superannuation Pension Trust Rules. Cabinet clears hiving off , monetizing BSNL's tower assets into a wholly owned unit of the state-run telco which can then monetize the assets to raise funds. 1. Memorandum to be submitted to the Hon'ble MPs (LS/RS) by all the Circle / District Secretaries immediately. 3. “Candle Light” March on 04.10.2017 at 18.00 Hrs from BSNL Corporate Office, Janpath, New Delhi to Jantar Mantar, New Delhi. All the Circle / District Secretaries are requested to submit the Memorandum After demonstration to the His Excellency Governor / LG of the State and CMD / CGMT / SSA Heads. The Memorandum should be submitted to all theHon'ble Member of Parliament of Lok Sabha / Rajya Sabha in their area immediately. Consistent efforts of AIBSNLEA yielded results in getting released the orders from BSNL Corporate Office for keeping the implementation of DoT order number 40-12/2004-Pen(T)(Pt) dated 05.07.2107 in abeyance till further order both in case of serving as well as retiring employees. It may be recalled that AIBSNLEA had filed an OA vide O.A./100/2649/2017 in Hon'ble Principal Bench CAT New Delhi against the DOT order dated 05.07.2017 for withdrawal of additional increment by fixation in same scale on post based promotion under EPP. Similarly, Com. Karan Singh, Advisor (North), CHQ, AIBSNLEA along with 27 applicants also filed case in the Hon'ble CAT Jaipur & Hon'ble High Court, Jaipur against the DoT Order dated 05.07.2017. Hon'ble CAT Jaipur has granted stay order on re-fixation of pay & recoveries as per above said order. Promotion and posting of LICE passed 35 candidates in JTO cadre after 04 weeks of successful field training. AIBSNLEA consistent efforts yielded result in getting released order regarding extension of Free Night calling facility to BSNL serving Group B, C & D employees having residential service telephone connections and concessional telephones connections as extended to any other subscribers and retired BSNL employees. BSNL Corporate Office issues orders regarding constitution of a committee to explore the modalities for implementation of revision of pay under 3rd PRC. As per the suggestion given by the Comrade GS, AIBSNLEA in the core committee of BSNL Unions and Associations with CMD, BSNL held on 09.08.2017 for constitution of a committee to explore the modalities for implementation of revision of pay under 3rd PRC. CMD BSNL constituted the committee immediately and the committee meeting was held yesterday wherein the committee has recommended 3rd PRC implementation in BSNL with 15% fitment benefits for its executives. The committee report will be discussed in the next week in BSNL Management Committee and thereafter in BSNL Board. After the approval of BSNL Board, it will be sent to DoT for consideration and issuance of presidential directives. AIBSNLEA filed an OA vide O.A./100/2649/2017 in Hon'ble Principal Bench CAT New Delhi against the DOT order dated 05.07.2017 regarding withdrawal of additional increment by fixation in same scale on post based promotion under EPP. Hon'ble PB CAT New Delhi has interim stayed said order today . DOT will file rejoinder on 24.08.2017. Details follows. Interview/Meeting of Volunteers from amongst the officers of DE/DE(LA) for posting at RTTC Lucknow with PGM(Admin/HR) Circle Office. Look after arrangement in DE/AGM cadre for 03 executives issued by circle office. Office Memoransum for implementation of Pay revision on CPSE's issued by Deptt. pf Public Enterprises . Our beloved President Sri Phoolchand , DGM(F) is retiring today on attaining the age of superannuation. His contribution for lifting the AIBSNLEA in UP(E) Circle will always be remembered forever during the first executive membership verification. He was a dedicated comrade and always think for the welfare of the members. AIBSNLEA UP(E) Circle wishes him a very happy & prosperous retired life. Time Bound upgradation for 10 executives from E4 to E5. List of JTO's requested for inter SSA transfer published by circle office. A General Body meeting of AIBSNLEA was held on 05/06/2017 at Azamgarh SSA , which was attended by almost all executives of engineering , accounts & civil/electrical stream. In this meeting election of new office bearers was conducted , in which Sri Kailesh Kureel JTO(E) , Sri R K Sonkar SDE and Sri Heera Lal AO were elected unanimously as president, distt. secretary and fin. secretary respectively. AIBSNLEA CHQ have been making its best efforts in DoT / Ministry/ DPE to conveyance the concern authorities for the implementation of 3rd PRC in BSNL Accordingly the facts are being informed to all concern through our CHQ Website. As rightly reported by AIBSNLEA in the morning of 20.7.2017 in our CHQ Website the actual status and process of 3rd PRC implementation in PSUs / BSNL was later on confirmed by Shri Niteswar Kumar ji (IAS) PS to Hon'ble MOSC in the meeting held with AIBSNLEA on 20.7.2017( Evening). Hence , AIBSNLEA is correctly informing all the developments on day to day basis to our members through our CHQ web site and doing hard work to ensure 3rd PRC Implementation in BSNL. But the so called Majority Association instead of informing the actual status and truth is creating hipe in the minds of the Executives for which the reasons are best known to them. The actual process of 3rd PRC implementation is that after the notification of 3rd PRC implementation in PSUs for the Pay hike of Executives the respective PSUs will take decision in their Board and will send the proposal to the Administrative Ministry for the issuance of the Presidential Directive. Similarly after DPE notification of 3rd PRC recommendations, BSNL Board will take the decision and will send to DOT for approval and for issuance of Presidential Directives. Now in the DPE notification it has to be seen that whether the Administrative Ministry/Board of the PSUs have been empowered by the Cabinet to allow dispension of the “Affordability Clause"of 3rd PRC report. In case Board/Administrative Ministry is empowered then BSNL Board and DOT Administration should implement the 3rd PRC in BSNL in the interest of its Viability otherwise, we have to fight organisationally. Today GS contacted the concerned Officers of DPE with regard to the Notification of 3rd PRC, it is understood that the draft notification on cabinet approval has been processed to the higher level Officers for approval. The notification of 3rd PRC is expected in the next week. Date for reporting officer is extended upto 07/08/2017 for writing APAR through ESS portal. Options are called by circle office for intra circle transfer and posting on look after arrangement in the DE/AGM cadre. BSNL CO issues instruction for streamlining the work of HR integration/promotions and for upgradation cases of executives. Extension of look after arrangement for 14 executives in DE/AGM Cadre. Circle Office issues a letter to provide the screening committee reports and APAR shown certificate for 30 executives of list no. 5,6 & 7 for promotion to DE/AGM . Congratulations , After a long persuasion by association finally today look after arrangement order for 21 executives in DE/AGM cadre issued by circle office. Options / Volunteers are called among JAO's/AO's for posting in 14 SSA's. Renewal of JTO to SDE (LA) of 111 executives. Time Bound IDA pay scale upgradation for 57 executives of circle office. Revision of IDA w.e.f.01/07/2017:- DPE has issued orders revising IDA from 117.1% to 119% w.e.f.01/07/2017. Membership Drive: All the Branch & District Secretaries are requested to ensure enrolment of maximum members by filling up of Membership form and subscription deduction format from salary before last date i.e. 15.07.2017. Memebership form and subscription deduction forms are attached below. Date has been extended for e-APAR through ERP only for reporting officer to 20/07/2017 and for reviewing officer to 20/08/2017. Circle Secretary along with Sri Ranjan Kumar DS LWTD and Sri A K Verma DS RTTC met Sri T N Shukla CGMT UPE on 22/06/2017. On this occasion Sri Praveen Varshney PGM(HR/Admin) , Sri H R Chaudhary Addl. GM(HR) and Sri D K Pandey AGM(HR were also present . The dies non case of Sri C L Sadhwani SDE(E) was also discussed. The delay in TBP of executives was also discussed. The look after arrangement from SDE to DE(T) and from AO to CAO was also discussed. Some other issues such as proper utilization of official vehicle , maintenance of I.Q. etc were also discussed. CGMT acknowledged the our problems and assured to take n/a in this regard. Volunteers are called by circle office from amongst the officers of DE/DE(LA) cadre for posting as faculty at RTTC Lucknow. Circle Secretary participated in the welfare board meeting and sports/cultural board meetings of UP(E) Circle held on 29/05/17. For minutes of meeting please click on below links. Date has been extended for filling of e-APAR through ERP up to the 25/06/2017. Letter by BSNL C.O. to GM(ERP) regarding clarification when reporting/reviewing officer is retiring . 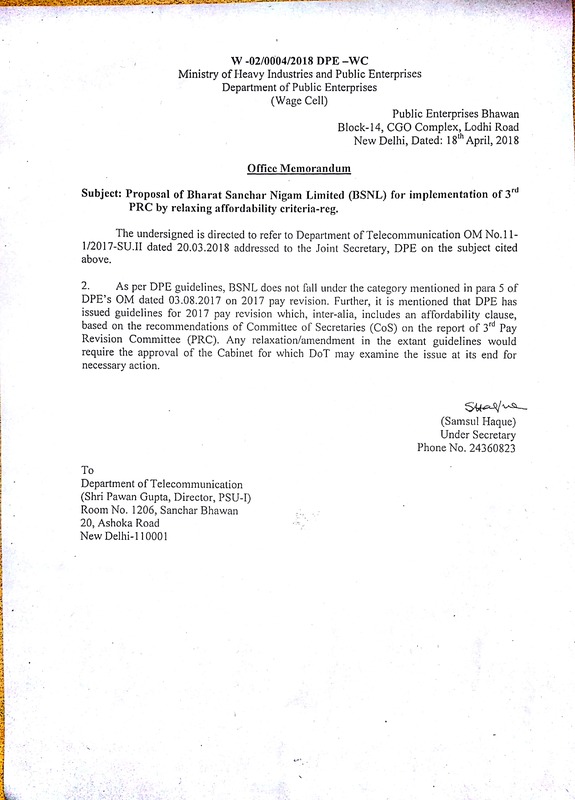 DO letter by CMD to Secretary DOT regarding 3rd PRC implementation in BSNL. CS alongwith Sri Ranjan Kumar DS LWTD , Sri Pradeep Kewlani CWC Member met with PGM(Admin/HR) Sri Praveen Varshney to discuss the HR related issues of executives. The discussions were held on various HR issues such as look after arrangement in DE cadre to fill up the DE vaccancies which was arises due to promotion from DE to DGM cadre. PGM (Admin/HR) assured that look after arrangement in DE cadre will be issued shortly. Renewal of look after arrangement in DE cadre for 66 executives. Extension of JTO to SDE Look After for 119 Executives by circle office. Result of 79 LICE passed candidates for JTO cadre is released by circle office today. AIBSNLEA welcomes all sucessful candidates. Allotment of seats in BRBRAITT Jabalpur for Phase -II Training w.e.f. 15-05-2017 to 24-06-2017, for 06 (Six) weeks i.r.o. successful departmental candidates under 35% & 50% quota of LICE for Gr 'C' to JTO Promotion Examination. Congratulations! AIBSNLEAs consistent efforts yielded results in getting released the long awaited DE to DGM Promotion Orders. AIBSNLEA extends its sincere gratitude and thanks to CMD BSNL, Director (HR), PGM (Pers. ), Jt. GM (Pers.) and his entire team for their overwhelming support and tremendous work. AIBSNLEA congratulates all the promote officers for the new assignment. Requirement of APAR's of all SDE (T) of Seniority list no 5,6 & 7 for considering their promotion to DET/AGM. Due to continuous persuasion by CS , Request transfer orders in JTO cadre issued by circle office . AIBSNLEA thanks to CGM & PGM(HR/Admin) for their cooperation. On the call of CHQ against arbitrary notification of DOT OM dated 28.03.2017 and non-submission of Committee report on Pay anomaly case i.e. Rs. 22820/- as initial basic for JTOs/JAOs recruited post 2007, Lunch hour demonstration was held at circle office , in which a large no. of executives participated. The huge gathering was addressed by CS Sri A K Singh , Sri Ranjan Kumar DS AIBSNLEA LWTD , Sri A K Verma DS RTTC ,Sri K K Ojha DE LWTD , Sri R K Mishra BS Mobile , Sri Parvani ACS(Civil) , Sri Pradeep Kewlani CWC Member and many other senior comrades. 28/03/2017:- CS along with Sri Ranjan Kumar DS LWTD , Sri Prabhat Kumar ACS , and Sri S. P. Choudhary CS AIGETOA met with CGMT on 25th March to discuss the various HR and company related issues. During the meeting the following points discussed specially 1)	Request transfer of Executives 2)	Posting of JTO also at RTTC Lucknow. 3)	Look after from SDE to DE and JTO to SDE cadre. 4)	Posting of DE’s after promotion to DGM in UP(E) Circle 5)	Problems faced by staff in outdoor maintenance. CGM has given positive response on above issues. During meeting PGM(Admin/HR) Circle Office was also present.